Antoine Diop wrote this article as a tribute to his teammate Abdula Jah and gave it to his English teacher, Ms. Holmes. She liked it so much that she copied it and gave it to all her students to read as a class assignment. Silver International is reprinting it with the authors permission. Despite a very difficult season, senior wide receiver and linebacker Abdula Jah has been an outstanding player for the Montgomery Blair High football program. Throughout his participation on the Blazer squad since his freshmen year, Abdula has been very productive to the team and learned a lot of things not just about football, but about leadership, respect, pride, honor and commitment. Abdulas teammates gave him the name of Lion Heart because he is a big hitter. He likes to hit his opponent very hard like hes supposed to. Abdula is a hell of a player and he is one of the most productive players on the team, said Mr. Jimmy Short whos in his fifth season as varsity head coach. According to Mr. Short, Abdula has probably one hundred and forty tackles so far as the Blazers prepared to face the Watkins Mill team on Friday, October 22, 1999 at Watkins Mill stadium. Lion Heart has been an outstanding player for us and he has been a true example for all of us, said Antoine Diop, who has been playing with Abdula for a couple of years now. As a junior, Abdula didnt really start because most of the players at that time had had more experience. But Abdula never gave up. He always played for the love of the game. Against Watkins Mill Jah made twenty-five tackles and he also caused a fumble because of his hard hitting. 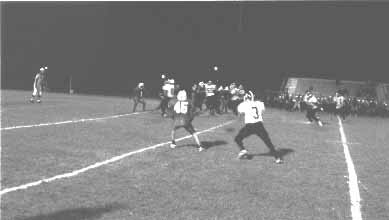 With about five minutes remaining in the game he hit the opponents running back and he stripped the ball from his hands. Then he ran the ball back for a ninety-two yard touchdown. Even though he works hard on the football team every day, he manages to get a good GPA. He is always taking care of his schoolwork and this is the reason why he is a good student athlete for the Blazers. Everything Ive been through so far with the football team has taught me many things and I know that life isnt easy. So from my part, I just do what I have to do, he said. Abdula hopes to continue to play football in college. We all wish good luck to our teammate senior wide receiver and linebacker Abdula Jah and we hope that he will have a successful future. But before he leaves Blair, we want to let him know that he is very important in our lives and we will always be talking about him. Thank you and good luck, big brother!